Stillhouse 100k rocked me. The midnight start came about an hour after bev and annabelle and I arrived in Hixson at the Holiday Inn…just enough time to change clothes, drink some coffee, and head to the start. I navigated the first 20 or so miles with Ryne Fletcher Anderson, which was a huge help, both in pacing and with the light. Hit the turn around in 6:37, kissed my wife, ate two hash browns and some sausage biscuit (McDonalds…please sponsor me!!! ), and headed back out into the pre-dawn darkness. Climb after climb, rock after rock, step after step, I grind through the night until the day begins to break. Aid comes and goes, with a refill on the bottle, and a piece of sandwich. Grind, grind through this mess, wondering how much I have in the tank…it’s been a lot of miles lately, so how much more before I crash? I look up and see a bear…then another bear…nope, just burnt out tree stumps. I look behind and see Ryne…nope, jut a trail in my vision…I look up again and I see my dead cat, Tommy…nope, just a pile of leaves. I look up and see rock after rock after rock…yep. I cross a creek on a bridge and pass the 3rd place guy, looking pretty rough. Crap…now i’m in 3rd…at the last aid station with about 13-14 miles to go. Looks like first place is an hour ahead, and second is about 30 minutes ahead, according to the time sheet. Memories of the first Upchuck 50k come to my mind, of how I lost to John Wygul by one second in a dead sprint at the finish…and I put that pressure on myself again this time, but instead of trying to hold on to 3rd, I tell myself to go after 2nd. Now, I can look at that decision as ludicrous, but at the time, it was protective…my focus was on a pursuit, instead of on holding off a chase. I put the hammer down. I pray to the good Lord to watch over my footsteps, so as not to fall or break my ankles on the rocks. I pray for strength which I don’t feel that I have any longer. I pray for perseverance through the pain, which is radiating through my legs. Fuzzy math dictates that I still have an hour to go. I gamble with my nutrition, taking my last gel, and drinking my last bit of fluid…not totally sure when this will end. This last climb is unreal. Finally I hit a left turn, look up, and see the road which had led us to this torture chamber in the midnight hour. Mile and a half to go…i’m not gonna catch 2nd, but is 3rd gonna catch me? I run faster and harder than I have all day, and put out a 1.5 mile effort that is faster than I have ever run, still fearing that 4th is right on my heels. A final turn towards the pavilion, a brief look to my left back up the road…not today, my friend… 3rd overall, in 13:04…came back faster than I went out. Overall, this was the hardest effort I have ever had in a race. I have never collapsed at the end, but this time it was unavoidable. I went down, thanking the Lord it was over, thanking the Lord for sustaining me, and thanking the Lord for the day! Thanks Brian Costilow, Dawson Wheeler, Katy Kennedy Holland, and everyone who made this effort possible! Stillhouse 100k was no joke! Thaks #swiftwick and #fuel100s for the love…and thank my lovely family for all you have done to allow me to love this sport! Thank you Jesus, my Lord, and my God, for allowing me to at least try to glorify you in all that I do…I know I fail miserably most of the time, but I thank you for your unending supply of grace, and for allowing me to love your creation, and giving us such a beautiful playground to test ourselves in! So good to see all my RC buddies…wish I lived closer…you all are so uplifting! Congrats to all of you out there with us…finishers, or not…to even dare meddle with such a beast of a race is accomplishment in and of itself! Female podium: Natalie Sims and Lori Foringer. 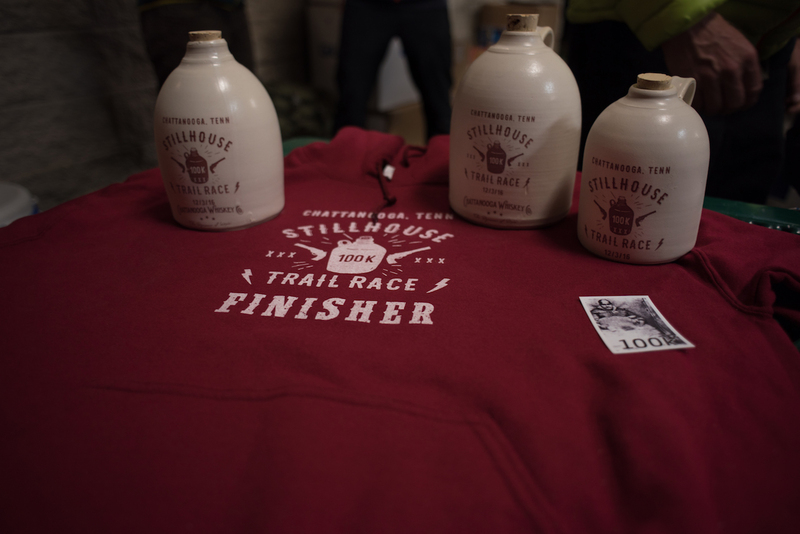 Visit Shine Photographs for more photos of the 2016 Stillhouse 100k. For more information about the 2017 Rock/Creek Race Series, visit Races.RockCreek.com.